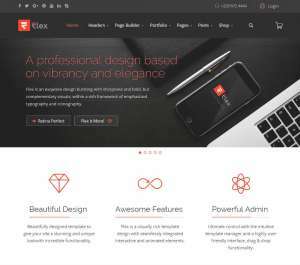 The multi-purpose Flex theme could be one of the best choices for creating your next Joomla website. It comes with unique page designs and the full set of demo content to provide you with a head-start. Make your site look unique by choosing any of the attractive header layouts. Flex comes with SP Page Builder, which allows you to use its drag-and-drop interface to create custom layouts for your pages. Choose any combination of the 57+ add-ons to decorate the pages. As the template supports eight post formats, you can publish any content you want.